I am so happy so have Julie visit today. Her new book The Discombobulated Decipherers was released November 21! It was always easy for me to have my babies. During my pregnancies I felt wonderful and my labor, all three times, was short, from three hours down to barely one hour with my last child. I occasionally compare writing a book to my months of pregnancy. When writing and creating characters and plots I amble along smoothly, just like my pregnancies. For me in a way, writing a book is a little like having a baby, although the birth of a book can take anywhere from a few months to as long as you want. When the book is finished you have a new baby, a new creation and then… the hard work begins. After your human baby is born there are sleepless nights and trying to figure out how to be a parent to this new beautiful human. After a book is written there are sleepless nights with editing and editing and editing. Once you feel your creation is growing into the book it should be and sent off to the publisher, a writer needs to nurture that book, spread the word and brag about it the same as you brag about that human child as he or she grows and spreads their wings and becomes a full-blown adult. My new book is here. 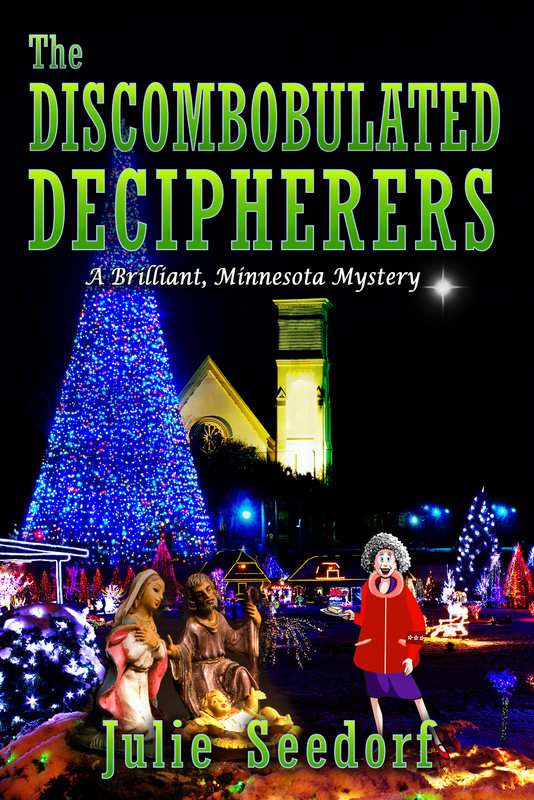 The Discombobulated Decipherers , the second book in the Brilliant, Minnesota series, grew in my mind and was put into words over a nine-month span of time. 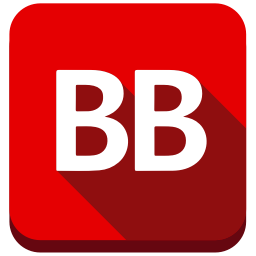 The storyline which takes place in fictional Brilliant, Minnesota, finds the Penderghast Puzzle Protectors disbanded and Jezabelle and Lizzy moving on to a new career as owners of the Brilliant Bistro. The seeds were planted and just as we do not know what to expect when we find we are adding a new addition to our family, the storyline took off with a life of its own surprising this author with its characteristics. Ernest the Elf is mistaken for a frozen statue in the square just when Brilliant is celebrating their Christmas Pageant with tourists coming from near and far for the celebration. Jezabelle and her neighbors as the Penderghast Puzzle Protectors thought they had solved the only puzzle the founding fathers of Brilliant had left before they disappeared, never to be heard from again. Their disappearance in itself is a puzzle. Ernest’s death leaves clues that all still is not as it seems in Brilliant. Since police chief Hank Hardy issued an order disbanding the Penderghast Puzzle Protectors, Jezabelle and her neighbors decide to change their name and become the Discombobulated Decipherers without Hank’s knowledge. It leads them to a Christmas story they didn’t expect. The surprise story characteristic I didn’t expect from this book birth was giving importance to a minor character from the first book in the series. Snoop Steckle decided on his own that he would make the life of this book memorable. I hope you take the time to meet my new baby, The Discombobulated Deciphers. And while you are reading I hope you remember that I am in the tough stage of nurturing my new child, feeding the media, growing the brand and expanding the series so it grows into a healthy family member of this series. Who knows what will happen in the next nine months before my next book baby is born. 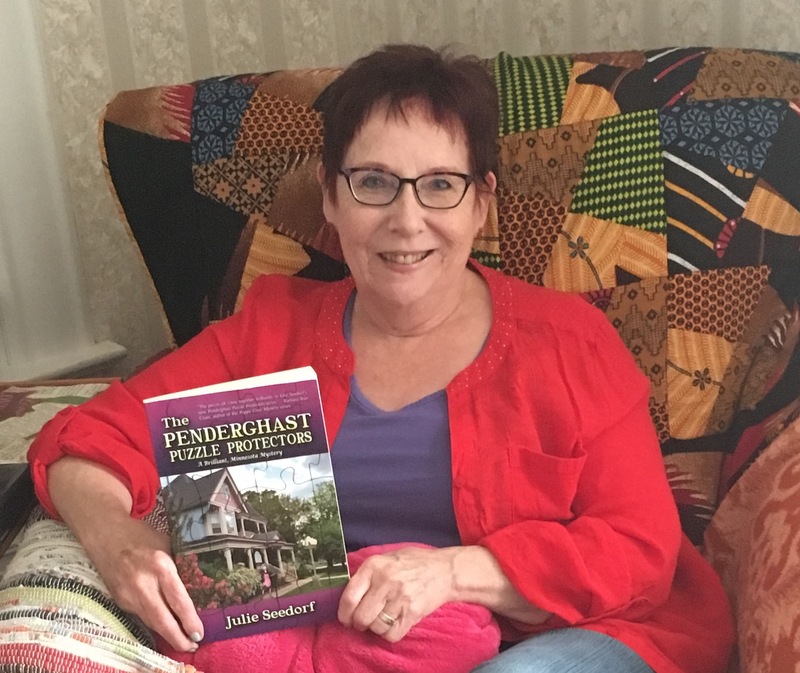 Julie is giving 2 Kindle copies of her new book away! Julie will be touring The Discombobulated Decipherers with Great Escapes in December!! This sounds fabulous–I’d love to read it! Julie is a new author to me. Book sounds like an interesting read. The Penderghast Puzzle Protectors: A Brilliant Minnesota Mystery (Brilliant Minnesota Series Book 1). Now I have both on my wish list! Thanks so much to Dolly for keeping me informed about great new books! This sounds great. I’m looking forward to reading it. Thanks for the intro to a new to me author. Looking forward to checking out this series.